In our previous post, we discussed the changes done in version 6.0 of Order Delivery Date Pro for WooCommerce plugin. In this post, we will discuss how you can set different options like Same Day Delivery cut-off, Next Day Delivery cut-off for different Weekdays. This feature is added in version 6.0 of the plugin. A new Weekday Settings tab is added under Order Delivery Date -> Settings menu to set up different options for different weekdays. The tab is available only when the Weekday Settings checkbox is checked under General Settings -> Date Settings link. By default, the checkbox is unchecked when the plugin is installed. But while updating if there are charges added for any of the weekdays, then the checkbox will be checked and the charges will be displayed on the Weekday Settings tab for the weekdays. There are few businesses like a restaurant where the customers generally visit the restaurant for food. But there some customers who want deliveries of food at their place. So you make the delivery but you also charge an additional cost for delivery for each weekday. For example, on Monday, Tuesday, Wednesday you don’t have many customers at the restaurant, so you can charges less for those days. But for weekends like Friday and Saturday you can charge more for delivering the food outside the restaurant. You can set this up in the plugin. If there are charges added for any of the weekdays in the earlier versions, then the charges will be displayed on the Weekday Settings tab for the weekdays. For the newly installed plugin, or if there are no charges added for the weekdays in the plugin, you need to click on the Insert Row button, select the weekday for which you want to add charges and mention the charges and checkout label for delivery charges. Once done click on Save Settings. Once, you have added charges and checkout labels for weekdays, if a customer selects the date from the calendar, then the additional charges with the checkout label for that weekday will be included in the order total. For example, if a customer visits your website and selects the date 24th December 2016, then the charges for Saturday which is $35 will be added with a checkout label as Weekday Delivery Charges in Your Order table on the checkout page. You can now set up different same day cut-off time for different weekdays. This feature is useful for businesses where you work for different hours on different weekdays. For example, you work from 9 AM to 6 PM on Monday to Friday and can take same day delivery orders until 3 PM. But on Saturday you work only from 9 AM to 4 PM. So you want that the same day delivery orders for Saturday should only be taken till 12 PM. So you can set the cut-off time for the same day as 12 PM for Saturday on Weekday Settings tab and 3 PM cut-off on the General Settings -> Time settings link. You can setup different cut-off time for weekdays only if the Enable Same day delivery checkbox is checked under General Settings -> Time settings link. Now if a user visits your website at 11 PM on Saturday as per the WordPress timezone. Then they can choose the same day for delivery in the calendar. But if the user visits the website after 12 PM, the same day will be disabled for delivery in the calendar. 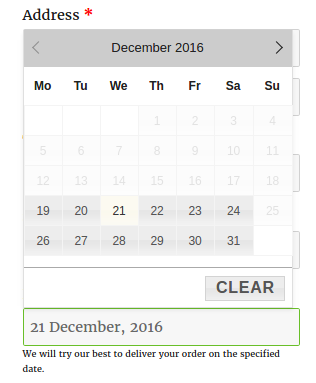 For example, if a user visits the website at 12.30 PM on 17th December 2016, then the first available date will be 19th December 2016. And if a user visits your website on other weekdays, the cut-off time for delivery will be 3 PM instead of 12 PM. Also, for next day delivery, you can set different cut-off time for different weekdays. This feature is useful for businesses where you work only on some weekdays like Monday to Friday and on Friday you want that the orders should be received before 2 PM for Saturday delivery. And on other weekdays you can accept orders till 3 PM. So you can set the cut-off time for the next day as 2 PM for Friday on Weekday Settings tab and 3 PM cut-off on the General Settings -> Time settings link. You can setup different cut-off time for weekdays only if the Enable Next day delivery checkbox is checked under General Settings -> Time settings link. Now if a user visits your website at 1 PM on Friday as per the WordPress timezone. Then they can choose next day for delivery in the calendar. But if the user visits the website after 2 PM, the next day will be disabled for delivery in the calendar. For example, if a user visits the website at 12.30 PM on 16th December 2016, then the first available date will be 19th December 2016. And if a user visits your website on other weekdays, the cut-off time for next day delivery will be 3 PM instead of 2 PM. If you have a business like online cake shop where you require different time for preparing delivery for different weekdays, then you can set up this under Weekday Settings. So for example, if you deliver the cakes from Monday to Friday and you require 24 hours to prepare cakes for all weekdays. But if a customer visits your website on Friday, then the first available weekday for delivery should be Tuesday instead of Monday. So you need to set the minimum delivery time to 48 hours for Friday. Minimum Delivery Time (in hours) option will be available for different weekdays only if the Same day Delivery and Next day Delivery is disabled. Now if a customer visits the website on Friday, the first available weekday for delivery will be next Tuesday. 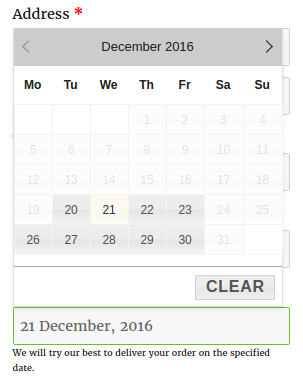 For example, if a user visits the website on 17th December 2016, then the first available date will be 20th December 2016. There are two more features under Weekday Settings tab which are Weekday before next day cut-off time and Weekday after next day cut-off time. We will be discussing them in detail in our next post.